[Classic: 4/13/2000] — April 12 marked the 450th birthday of the writer we know as “William Shakespeare.” Edward de Vere, 17th Earl of Oxford, was born on April 12, 1550. Oxford adopted the name “Shakespeare” in 1593 when he published the poem Venus and Adonis, which he dedicated to the young Earl of Southampton. Oxford had fallen in love with the handsome teenager, who was being urged to marry his daughter Elizabeth Vere. Southampton is also the “lovely boy” to whom most of the Shakespeare Sonnets are addressed. When I argued this in my book Alias Shakespeare (published by The Free Press in 1997), I expected to get quite an argument from the academic Shakespeare “experts.” To my surprise, they put up no real resistance; without exception, all those who attacked the book tacitly admitted that the Sonnets do indeed describe Oxford much more closely than they describe the legendary William of Stratford. Of course, being scholars, they tried to disguise this admission with lots of scholarly bluster, but there it was: nobody bothered trying to prove that you can make a case for William of Stratford from the Sonnets, for the very simple reason that you can’t. The poet of the Sonnets fits Oxford to a T: his ruined reputation, his rumored sexual attraction to boys, even his lameness. Not quite the wholesome Shakespeare we heard about in English class, but facts are facts. The Shakespeare plays bear witness to Oxford’s authorship in many ways. The Shakespeare plays bear witness to Oxford’s authorship in many ways. Polonius and his children in Hamlet are clearly modeled on Lord Burghley, Oxford’s father-in-law, and his children. These characters don’t appear in the Danish legend the play is based on. Oxford’s wife died young in 1588; the first known reference to the play occurs in 1589. This date has puzzled the Shakespeare scholars, since 1589, though the natural moment for Oxford to write such a play, would be far too early for William of Stratford to have written it. The scholars try to get around these problems by positing that the 1589 reference alludes to a different Hamlet play, though no trace of this hypothetical play has ever turned up. They deal with the Sonnets by positing that the poems are merely "fictional," though this is not at all the impression the anguished Sonnets make on candid readers: why would an Elizabethan poet feign homosexual love for a boy, thereby risking not only disgrace and ridicule but capital punishment? In addition, the greatest Shakespearean comic creation, Sir John Falstaff, bears witness to Oxford’s paternity. Falstaff quotes the Bible constantly; and as a scholar named Roger Strittmatter has discovered, several of the verses he quotes are marked in Oxford’s personal copy of the Bible! If William of Stratford created Falstaff, how did he happen to cite so many of the same scriptural passages Oxford had singled out? If William of Stratford created Falstaff, how did he happen to cite so many of the same scriptural passages Oxford had singled out? In fact, as Strittmatter also notes, the Shakespeare plays contain hundreds of biblical citations corresponding to Oxford’s markings, particularly in the rather obscure book of Ecclesiasticus (now deleted from Protestant editions of the Bible). Even the names of people and places Oxford visited in Italy and France are echoed in the plays. Even the names of people and places Oxford visited in Italy and France are echoed in the plays. Baptista Minola in The Taming of the Shrew seems to combine the names of Baptisto Nigrone and Benedic Spinola, who are mentioned in Oxford’s letters from the Continent. Launcelot Gobbo in The Merchant of Venice takes his surname from the Gobbo di Rialto, a statue in Venice. All’s Well That Ends Well mentions a local war that occurred while Oxford was in Italy. How could William of Stratford have known all these things? The Shakespeare works were dedicated to three men by name — the Earls of Southampton, Pembroke, and Montgomery. Each, at one time, had been slated to marry one of Oxford’s three daughters, and Montgomery did marry Oxford’s youngest daughter, Susan Vere. As Orson Welles remarked, there are far too many “coincidences” favoring Oxford’s authorship to explain away. And no similar details connect the Shakespeare works to the life of William of Stratford. It’s quietly sinking in that Oxford was the real “Shakespeare.” Sooner or later the academic “experts” are going to have to ’fess up to the most egregious blunder in the history of literary scholarship. Copyright © 2016 by the Fitzgerald Griffin Foundation. All rights reserved. This column was published originally by Griffin Internet Syndicate on April 13, 2000. 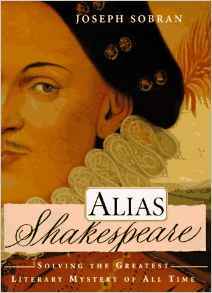 Joe Sobran is the author of Alias Shakespeare: Solving the Greatest Literary Mystery of All Time (The Free Press of Simon and Schuster, 1997).